T-Shirt screen printers often ask what’s the best software for doing color separations such as simulated process color, index and 4 color process. In addition to the above, other types of separations are often discussed. These include spot color, black & white style gray tone, duotone and color separations geared towards specific types of screen printing such as discharge and extended gamut CMYK with added spot colors. When researching software for the screen printing shop, all the bases need to be covered to include all variables. Overall, there’s not many choices when it boils down to quality Photoshop plugins which assist in generating separations for screen printing. Believe-it-or-not, the market for software such as this is small and highly specialized. Therefore, only a small group of developers with the skills required to offer products such as these exist. 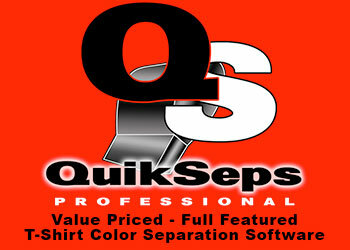 The most often used within the industry are UltraSeps and QuikSeps. To a lesser extent, outdated programs such as FastFilms might be found in some shops along with limited feature software like Separation Studio. Some solid advice is to steer clear of possible free solutions and no-cost crazy ideas found online. These will always result in leading those new to automated color separations down the wrong path and create confusion and frustration from day one. Regarding UltraSeps, a question I often receive is: “What’s the difference between UltraSeps and QuikSeps”? I get this one all the time for some reason, just about every day in fact. Possibly since both are software products of the same category that do essentially the same thing, and that being color separations for t-shirt printing. Let’s put this question into perspective…..A table top 4 color manual press and a 12 color modern automatic press can both print t-shirts, so they must be essentially the same thing….right? WRONG! There has to be advantages and disadvantages when comparing the two. Just because two products can perform a similar function doesn’t make them equivalent to one another. So, here we’ll put forward an absolute comparison of color separation software. In this case, UltraSeps and QuikSeps as I know every aspect about them! The below list outlines the primary differences and should help with your decision on deciding which program is right for your shop. The items in bold near the top reference enhancements made to UltraSeps v2 when compared to the initial release. Increased Ease Of Use – This is the most important single improvement when compared to the initial version of UltraSeps. We’ve removed just about every possibility of error from UltraSeps v2. The program includes logic that examines your file prior to running a separation and most other functions so even if its formatted incorrectly for use, the separation is generated or file is processed. So images containing more than 1 layer, flattened files, art with little color information, jpegs, grayscales and files you’ve received from Aliens in another galaxy all separate without any end-user intervention. This is a great feature, especially for those new to the program or users somewhat inexperienced with Photoshop. This took a great deal of time and experimentation to implement. UltraSeps Simulated Process #3 – We’ve added a new, revolutionary simulated process color separation module called Simulated #3 to UltraSeps Version 2. This new process generates many of its channels using color data that excludes all black and gray information from the image prior to creating color channels. The results are very clean, pure and smooth spot color channels not attainable with any other product. This module I refer to as a “hybrid” as it uses several color spaces to generate the final color separation. We were originally going to offer this as a stand-alone product but have decided to include it free with UltraSeps 2. Therefore, UltraSeps v2 now includes three unique simulated process color separation modules, each generating simulated process separations quite differently. Driver Installation Removed – One of the big issues we’ve struggled with was the Driver Setup of the licensing program used by UltraSeps. On some systems, it took long to install or was confusing to the end user. It was also not compatible with 64 bit Macintosh systems. 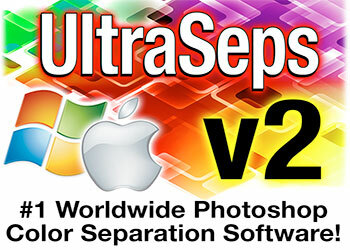 UltraSeps 2 is a “Driver Free Application”. So, what does this mean? Well, for one, it makes using the trial version simple and painless. There is no potential for error if the drivers have not installed, since they’re aren’t any. It also makes unlocking the program at time of purchase easier. New Commenting Added – A mistake we made with UltraSeps was not providing comments or assistance to the end user prior to clicking an Action Button to initiate a process. This was not an issue for those comfortable with the program although did cause some confusion with many new users. Therefore, each important function of UltraSeps Version 2 is commented as to what the process is about to do and what is expected from the end user prior to the process running. Basic 5 Color Simulated Process – We realize that not everyone requires a complex separation with many channels to work with, so we’ve added a basic 5 Color simulated process separation and have removed the functions to reduce the Simulated #1 separation down to 5 colors as this has caused confusion with some users. Auto Register Marks Improved – We’re aware that many use UltraSeps to apply custom register marks to the separation. The new custom register marks functions automatically adjusts the size of the canvas to fit the marks eliminating the end user having to make this change manually, which is easily overlooked. General Improvements – Just about every function that permits the end user to generate custom spot color channels, fleshtones, whatever, has been updated and simplified. And for those using our No RIP function, its processing speed has been increased by about 50%. At first glance, those familiar with UltraSeps won’t immediately see a vast difference as much of the new technology is under the hood. Although I can assure you that after using UltraSeps Version 2 for a while, the enhancements will become clearly apparent. Aside from the obvious additions to the program, as mentioned previously, UltraSeps v2 is really all about simplicity and speed. 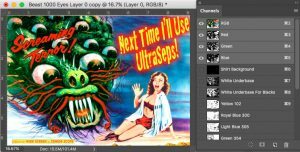 I believe that UltraSeps is not only the finest color separation program available offering the most extensive feature set, but is also the easiest to use. UltraSeps is based on an extensive collection of Java based programs and Automation Plugins. These provide the ability to add logic to the program, thus permitting the functions to think and make decisions based on the image. Therefore, UltraSeps can perform tasks that are not possible within Photoshop alone. Although the program uses Photoshop Actions, most act as only a “switch” to trigger external applications. 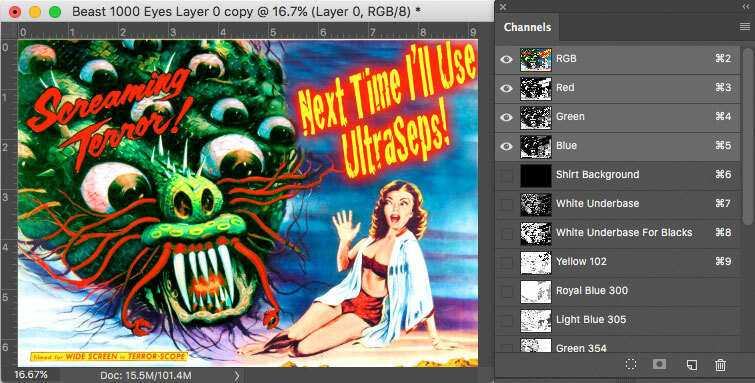 UltraSeps includes three completely different Simulated Process Color Programs. Each generate colors somewhat differently and takes an alternative approach. The second method adds tremendous value to the product. In fact, prior to deciding on developing UltraSeps, we were considering offering it as a stand-alone product. The generation of Custom Color Channels has been greatly simplified. Following the selection of the color, a single click is only required to complete the channel as the program can actually read the user selected RGB values. The CMYK Process Color functions now retains the original RGB channels upon completion making the addition of custom spot channels possible. Automated Custom Spot Channel generation has been added to the CMYK function to easily add a spot color that CMYK alone may have difficuly with. We’ve also included a unique automated function that removes a precise amount of a spot channels data from the CMY channels to guarantee a bright, crisp image on press. Index Separations now include traditional halftone underbase and highlight channels in addition to the indexed white channels. Many printers including myself prefer to use halftone base and highlight with index and now UltraSeps has made this a simple process. The generation of Custom Index Separations has been simplified. Following the selection of the color palette, a single click is all thats required to generate the user-defined channels. No more clicking around or any intensive end-user interaction. A unique first-of-its-kind feature called Specialty Separations has been added. Take any image and convert to a Quad-Tone or Tri-Tone file that prints like a dream. Perfect for a different look or for preprint lines. The Register Marks function now adds center marks in addition to corner marks. Its also completely automated, no end-user selection of the channels required. Just click the button and the marks are added automatically to each channel. 8 different sizes of register marks are available. Basic Spot Color separation has been highly automated. Just select a color within your image, click a button and a perfect spot channel is generated containing the correct color data. Here again, no end-user interaction required. We’ve added two additional modules to our popular QuikDraw which converts any file to a black and white image. QuikDraw 5 is adjustable which permits the user to determine the amount of conversion. A new module named UltraSketch has been added which some may find superior to QuikDraw on many images. The process generates two files with each retaining a hand drawn, pen and ink look without black fills within dark color areas of the graphic. The ability to repair jpegs has been addded. Our filter removes artifacts, unwanted grain and more from images such as jpegs, scans from magazines, etc. Composite Proof generation is now completely automated regardless of number of channels. Just click once and an RGB proof of your color separation is complete and ready for output to a color inkjet or send to your client. For those using Discharge Ink, we’ve added a function that generates a discharge specific underbase from an exisiting base. The discharge base prints white where white is seen within the art and not under top colors as in a traditional separation. The ability to output films without a RIP has been enhanced. Upon completion, a single pre-screened multichannel file with color information, channel names, etc. is generated. It looks like a separation along with the ability to preview in color, turn channels on and off, add register marks, retain color labels, etc., although it can be printed without the need of a RIP. The Image Fix functions have been enhanced alone with the addition of an Ultra Image Fix Intense process to help assist with images of poor quality. A function named Ultra Brighten Shadows has been added to help reveal hidden detail in problematic images. An “XL” version of the Low Resolution Enhance Filter has been added to further increase the resolution of smaller images while retaining as much integrity as possible. An automated Cartoon Style Filter is now included which converts a color or b&w photo into three totally different cartoon style effects. A simple automated adjustment to clarify blacks within an image has been added. And there you have it! An itemized list to help in deciding which color separation program is the right choice for your screen printing art department!